What are some of your favourite uses? You can use it by itself for face and body as a natural moisturizer. Melt it down and use it as a pre-poo (pre-shampoo treatment). In a shea butter lotion bar stick for easy use. Alone or in a pregnancy stretch mark salve to ward off stretch marks. As the best under-eye wrinkle remover and bag-reducer. Once melted, with some essential oils, it makes a great massage butter. Itworks wonders as an SPF 6 skin lotion, and brightens up your skin. By itself on the lips or in homemade lip balms. How is this shea butter different from the shea butter smoothie? Try to double boil it or gently heat your shea butter until it just melts. Pour through a strainer to remove any particles. Once strained, pour the shea butter into clean small containers in pre-measured amounts. For example, a 250g glass jar, or lotion bottle so that you’re ready to make different shea butter recipes. Pure, raw, unrefined shea butter. 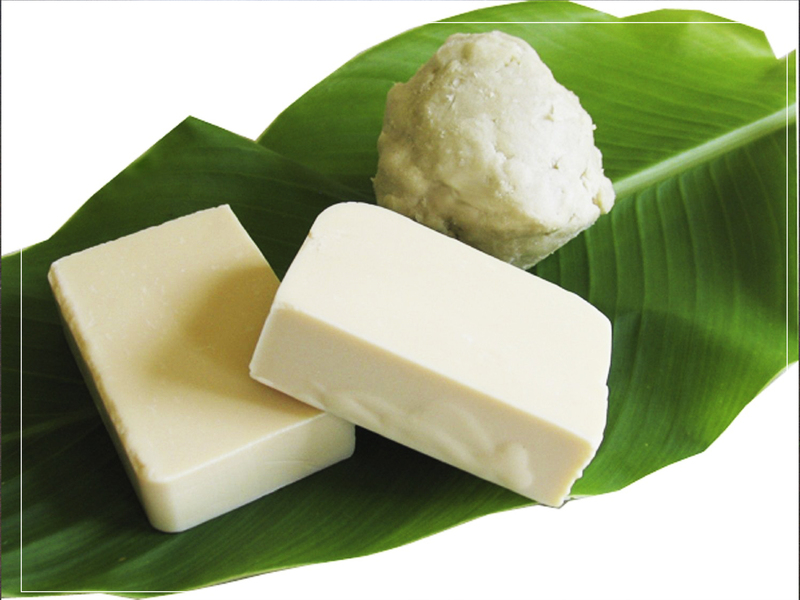 1 kg of raw, unrefined shea butter for those who love to whip up their own special blend of skin and hair goodies. 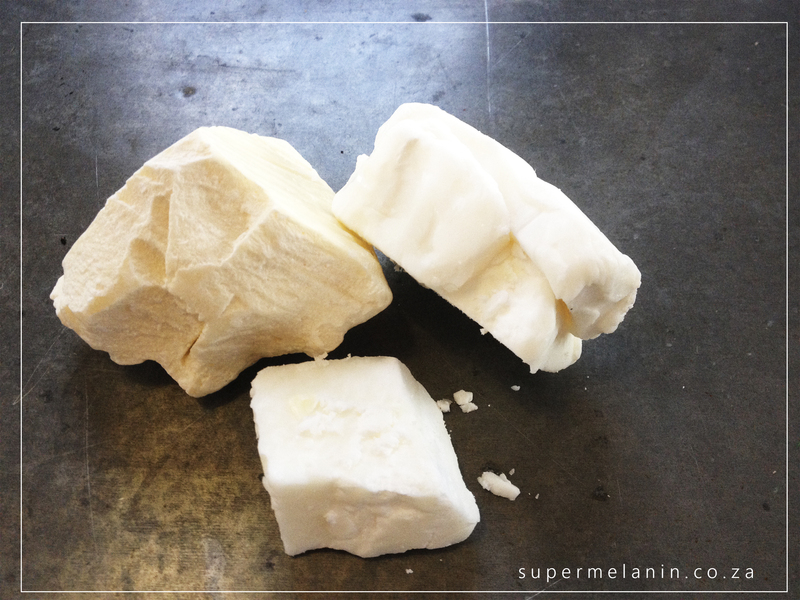 Our Ghanaian shea butter is a skin superfood that comes from the Shea (Karite) tree. And guess what? It’s naturally rich in vitamins A and E. These are vitamins that are absolutely essential to healthy skin and hair. Need a sunscreen? Our shea butter offers UV protection (SPF ~6) and provides the skin with essential fatty acids. These are nutrients necessary for collagen production. That means you’re on your way to healthy, glowing hair and skin again. If you’re not a fan of raw shea butter, why not give our shea butter smoothie a try? It’s our favourite blend of pure shea butter and essential oils, designed to make your skin and hair happy. I’ve been using this product on my daughter’s hair and we all use it as a body moisturizer. After a few weeks, I can tell you that I am not going to use anything else. The quality and price is amazing. Our hair never looked healthier. This raw Shea Butter has also helped clear dark marks on my face and has even lightened my stretch marks on my tummy and thigh area. A bit pricey, but worth it. The quality is FANTASTIC. The smell is present, but it’s hard to describe, it’s a nutty, earthy smell which I personally find quite pleasant. I used much less than I expected and I can’t wait to try other products. So, I initially intended for this to be my hair butter only, but it’s so rich and creamy that I use it as my daily skin “lotion”. I replaced my Vaseline intensive care with this and my skin feels so soft. I AM IN LOVE WITH THIS BUTTER. It arrived sealed air tight and fresh. The colour was ivory, which I heard is the right colour for raw or unrefined shea butter. It was a good, medium sized brick and I expected to make my total batch in one sitting. Surprise. I only used half a block (I used a recipe I found online and mixed it with cocoa butter, coconut oil, sweet almond oil, avocado oil, and essential oils). It’s held up very very well. And the best part is it wasn’t grainy at all!!!! I highly recommend this product. I have already forwarded the page to my family and friends and I will most definitely be purchasing this unrefined Shea Butter again! Dry skin restored. It’s honestly a miracle worker, waymaker, promise keeper! I am so excited, I’ve only been using it for a week, but I can see a visible difference. The smell is a little like white chocolate and so addictive. I didn’t see many reviews for using this product on hair, so I was a bit nervous, but I hope this review helps those who are looking for using shea butter on your hair! Bought this to mix with coconut oil and make into a deep conditioning treatment for my hair, and it is perfect. My scalp feels so good you guys. I had an issue this year with my ends, but they are on point now. It’s so difficult to find high quality shea butter and I was very worried about purchasing online. I am glad I made the choice. Lol. I purchased this with the intention of making whipped body butter. Fortunately don’t have any serious skin problems, but I was hoping to combat that dry winter skin that comes occasionally. I was also worried at first that this would be strong-smelling or that the package would only contain a small amount (so many scams! ), but I was wrong to worry! Great product and great packaging. So glad for this unrefined shea butter. My hubby uses the whip I made with this as an after shave and finds it very relaxing. It’s very fragrant. If you don’t like the nutty smell, don’t use it when you plan to go somewhere. It sits on the skin without soaking in for quite a while, so you have to rub it in well. I usually put it on at night and wear clothes I don’t mind getting oil on and in the morning, my skin feels softer. So far, I’ve made whipped and un-whipped body butters (mix with coconut oil, beeswax, and essential oils) which have been very popular at my workplace. This raw unrefined shea butter blends well with other oils and butters when they’re all heated, which makes it an incredibly versatile product. I’ll be repurchasing soon. Moisturized and tightened my skin, but also caused me to break out unfortunately which is unusual for me. Bought some shea butter when I was traveling in Nigeria, and was disappointed when it ran out. Looked everywhere for shea butter that doesn’t cost an arm and a leg. So happy with this and glad to support black business. Highly recommend for those with dry hair. This shea butter is the best moisturiser on the market. I previously bought one from Faithful to Nature, but found it to be too grainy. I tried this one and its been such a pleasure. I use it throughout the whole day and I love the smell. YES! HUGE plus is it’s pure and unrefined. I’ve been using it for a couple of months now and still not even halfway. Definitely worth it. My skin has responded to it well.